National Research Council (US) Committee to Update Science, Medicine, and Animals. Science, Medicine, and Animals. Washington (DC): National Academies Press (US); 2004. National Research Council (US) Committee to Update Science, Medicine, and Animals. Washington (DC): National Academies Press (US); 2004. Today, it is hard for us to fully appreciate the great revolution in medicine known as “germ theory” and the role that animal research played in its development. It seems impossible that people once believed that foul odors could create disease or that “evil spirits” could cause a person to become ill. We have also forgotten how rare it was for parents to see all of their children survive to adulthood. Still, it has been little more than a century and a half since Robert Koch made the discoveries that led Louis Pasteur to describe how small organisms called germs could invade the body and cause disease. In the final decades of the 19th century, Koch conclusively established that a particular germ could cause a specific disease. He did this by experimentation with anthrax. Using a microscope, Koch examined the blood of cows that had died of anthrax. He observed rod-shaped bacteria and suspected they caused anthrax. When Koch infected mice with blood from anthrax-stricken cows, the mice also developed anthrax. This led Koch to list four criteria to determine that a certain germ causes a particular disease. These criteria are known as Koch's Postulates and are still used today. Integral to these criteria is Postulate #3, “The disease must be reproduced when a pure culture is inoculated into a healthy, susceptible host.” Even today, with all of the advances in modern science, it would be impossible to prove that a specific germ is responsible for a disease without the use of laboratory animals. ANTHRAX—A disease caused by Bacillus anthracis bacteria. 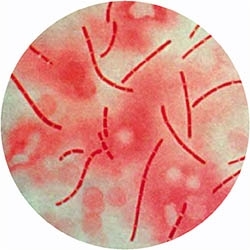 Can cause skin lesions (cutaneous anthrax), breathing difficulties and shock (inhalation anthrax), or severe vomiting and diarrhea (gastrointestinal anthrax). CULTURE—Micro-organisms, tissue cells, tissue, or other living matter grown in a specially prepared nutrient medium. Also refers to the cells grown, i.e., a culture of bacteria. GERM—A disease-causing organism, such as a bacteria, parasite, or virus, usually single celled. Until the 20th century, it was common to lose a child to disease. Smallpox, polio, diphtheria, whooping cough, tetanus, measles, and mumps maimed and killed thousands of children every year. But due to the development of vaccines, there has not been a single natural case of smallpox in the world since 1977, polio has been eradicated in the Western Hemisphere, and whooping cough, tetanus, and mumps are rarely seen in developed countries. Smallpox causes blisters similar to chickenpox. Smallpox is easily spread through coughing or sneezing, or through contact with contaminated clothes or bed linen. Twelve and 14 days after exposure, the patient develops a fever with severe aches and pains. A rash then appears over the entire body including the palms of the hands and soles of the feet. Death occurs in 30% of patients due to a massive immune response that causes clotting of the blood and organ failure. Vaccination before exposure to smallpox prevents the illness. There is no known treatment; however, vaccination up to 5 days after the exposure may help to prevent death. Polio is caused by a virus that enters through the mouth and is easily transmitted from person to person, particularly between children during the summer months. It causes headache, fever, and aches before entering the bloodstream and infecting the nerves controlling movement. The disease causes paralysis in the arms and/or legs (spinal polio), throat, eyes, face, heart, or lungs (bulbar polio), or both (bulbospinal polio). It can lead to suffocation and death caused by paralysis of the lung muscles. Before the invention of the “iron lung,” about half of children with bulbar or bulbospinal polio died. Copyright © 2004, National Academy of Sciences. National Research Council (US) Committee to Update Science, Medicine, and Animals. Science, Medicine, and Animals. Washington (DC): National Academies Press (US); 2004. A Theory of Germs.